Our knowledgeable ASA and CYA sailing instructors have put together a concise and accurate 101 and 103 sailing study guide to help you study for your ASA 101 & ASA 103 Basic Keelboat and Basic Cruising Exams. Our 101 and 103 sailing study guide will help you easily pass your ASA 101 Basic Keelboat and ASA 103 Basic Cruising exams. Remove the pressure associated with preparing for exams – we have done all the preparation for you..
As you can see, we cover all the Basic Keelboat and Basic Cruising sailing standards. To ensure that you will pass your ASA 101 Basic Keelboat and ASA 103 Basic Cruising examinations, we provide you with a 62 question 101 and 103 practice exam and answer key. When do I need to reef my sails? When is a vessel a passing or an overtaking vessel and what collision regulations apply? A vessel motor sailing after dusk should display what lights? You are sailing in fog, what sound signals should you make? What’s the first thing you do when you discover your vessel is taking on water? 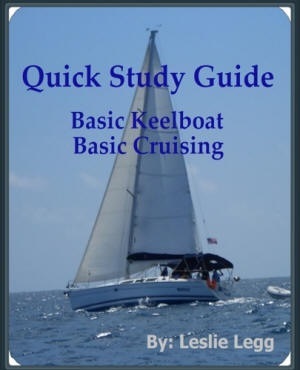 Our sailing study guide for the 101 Basic Keelboat and 103 Basic Cruising courses is available in two formats: Soft Cover (printed) and the PDF version. The PDF enables you have the study guide on your smart phone, notebook or laptop. Order the printed soft cover version of our study guide and we will also send you the PDF version at no additional charge. Place your order now and you will automatically receive a link for downloading. We accept all major credit and bank debit cards. As a Paypal Verified merchant, all payments are processed through Paypal, a recognized leader in internet security. Note: You do not have to be a paypal member in order to have your payment processed.